LaVergne, TN - Forming with a vengeance is the spirit behind the 2012 JET® metalforming lineup. These durable machines are capable of creating innovative product designs, applying precision metalforming techniques and providing over-and-above customer service. They are meant for professionals and enthusiasts who believe metalforming is more than just a job or project - it's a passion. "JET's customers speak and we listen," said Peggy McGann, product manager for JET Metalworking. "With the launch of our 2012 metalforming line, we made a number of innovations with feedback from experts and users in the field. Our new line helps them form with a vengeance." JET's 2012 line consists of 25 metal forming machines to satisfy the production needs of HVAC installers, fabricators, welders, farms, building maintenance, schools, mechanical contractors, military bases, aircraft and ship repair operations and home shops, to name a few. The full range of JET fabrication equipment includes shears, brakes, slip rolls, English wheel, arbor presses, shop presses, notchers, rotary machines and planishing hammer. Each machine is backed by a full two-year warranty. 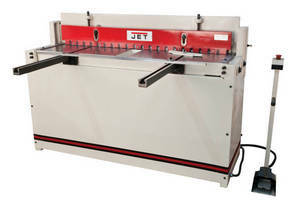 For example, JET's new 52" Pneumatic Shear (#756203, $4799) features pneumatic controls that make shearing a one-man job, and the low cutting angle makes it easy to cut narrow strips without twisting. The pneumatic shear's cast iron frame eliminates blade deflection, and its precise bed and beam alignment assures cutting accuracy. An emergency stop button enhances safety. Maximum cutting capacity is 16 gauges for mild steel and 12-14 gauge for aluminum and copper alloys. The new JET 50" Electrical Power Slip Roll is available in 2HP, 220V, 1-Ph (#756027, $3299 and 1HP, 230/460V, 3-Ph (#756028, $3299) models to accommodate HVAC and FAB shops with different types of electrical service. This three-roll machine has two driven rolls, and all rolls are constructed of hardened, polished high-carbon steel. A heavy-duty frame and base, plus welded cabinet, insure precise rolling of mild steel sheet up to 16 gauge and 50" wide. The forming roll is equipped with an attached position scale for equal pressure adjustment. The machine's convenient foot control assembly features a safety switch for emergency shut-off. Another must-have metalforming machine is the new JET Floor Box and Pan Brake with Foot Clamp, available in 40" (#752125, $2599) and 50" (#752127, $2949) models. Its foot-operated clamp saves strain on the arms and back, and there's a hydraulic spring to assist in raising the clamping handle. A wide assortment of finger widths provides versatility. Fingers are black-ceramic-coated to prevent rust and ensure long life. Not to mention welded-steel-plate body sections with heavy truss rods and braces - built for the long haul in busy shop environments. Visit jettools.com for more information on JET metalforming equipment and to request a copy of our Forming with a Vengeance brochure. JET is backed by 750 authorized dealers nationwide. About Walter Meier (Manufacturing), Inc.